Digital Assistants Are Here - Is Your Business Ready? ‘Alexa, where are my shoes?’, ‘Alexa, what did I have for breakfast?’, ‘Alexa, can you tell the neighbours to keep it down?’: all things that you can’t currently ask of a digital assistant (or at least not with any success), but that you feasibly might able to in the future. These ‘assistants’ and the AI-powered voice search that’s behind them might still have their limitations, but they’re rapidly arriving in a home or an office near you. Studies suggest that over 50 million smart speakers will be sold in 2018, doubling current ownership and making it the fastest growing consumer technology on the market. To state the glaringly obvious, that’s enough for the digital marketing world to need to sit up and take notice. What might be less glaringly obvious is how these assistants will impact your business, and what you should be doing to make the most of this opportunity. Digital assistants (also called virtual assistants or voice assistants) use voice-controlled AI to carry out functions like search the internet, making calls or connecting with other devices in response to spoken commands. The most commonly used assistants include Alexa, Siri, Cortana and Google Assistant, and can be either embedded into smartphones or sold as stand-alone devices that usually take the form of a smart speaker. So, first things first, why should you care about these devices? The simple answer is that you should care because your consumers do: 66% of consumers who use a stand-alone digital assistant say they use their smartphones for fewer activities. What that really means is that these assistants aren’t just a fun feature - they’re central to devices that are fast becoming an important part of our daily lives. To communicate effectively with your users, you need to be using the same platforms as them, and increasingly that means being flexible between various devices - including smart speakers. Users will start an interaction on one platform, return to it on a second, complete a transaction in the third… Being active on multiple platforms and being able to coordinate a cohesive experience across them gives you the best chance of delivering not just what users want, but when and where they want it, as well as keeping up with the seamless digital experiences they’re increasingly expecting as standard. The most direct way of achieving this is to enable customers to engage with your business or product through their smart speaker. On Alexa, that means developing a Skill. Thankfully, we’re not talking about the kind of skill that involves evening classes or training sessions: Alexa Skills are essentially apps - they’re extensions to the core Alexa capabilities, produced by external companies. Some of the most popular Alexa skills include playing music via Spotify, ordering a taxi via Uber, and checking your schedule with Google Calendar. The rise of these digital assistant ‘skills’ has the potential to be hugely advantageous for businesses. For retail, a digital assistant app could encourage customers to re-order products by simplifying the transaction to just a few words, or allow them to check whether an item is back in stock. Travel skills could be used to announce up-to-the-minute status updates and arrival times, and gambling skills could give customers current information on changing odds. The speaker function of the device makes it a good fit for media too, finding and playing podcasts, or playing audio versions of magazine features. That all sounds great. So, the age of mobile is over…is it? 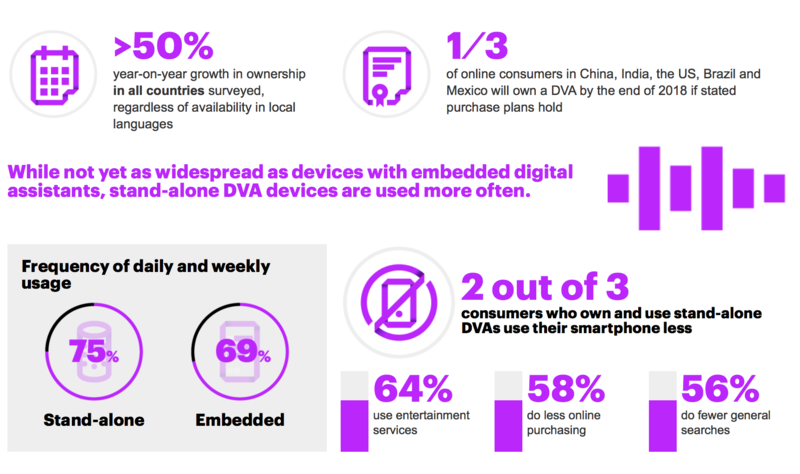 The majority of IoT and AI technology still relies on mobile - the original ‘smart’ device - as the hub that connects the network of devices and software that we now use. To search for and manage Alexa skills, you’ll still need to use an app on your phone. The voice control of element of smart speakers means that these digital assistants are also limited by distance: they’re great for controlling smart home devices when you’re in your home, but when as soon as you’re out the door that speaker stops being quite so smart, and you have to turn back to mobile apps. Since very few smart speakers feature screens, there are some tasks that these devices don’t suit: anything that requires visuals, like browsing items to buy or engaging with social media, still require most users to return (you’ve guessed it!) to mobile. The limitations of smart speakers mean that mobile apps are just as important for businesses and consumers as before. However, as digital assistants become increasingly common and shape the expectations that users have of their devices, the demands we make of mobile apps are likely to change, and so is the role they play as a platform for interactions. Although digital assistants and smartphones provide different features and opportunities, mobile can still learn a lot from the popularity of Alexa, Siri, Cortana and the rest, particularly when it comes to engagement. Let’s start by looking at one of the major appeals of smart speakers: the ability to search and command the AI via voice. This feature means that you can interact with your device and carry out hundreds of different actions all whilst you’re sat at your laptop on the other side of the room, or washing the dog, or just can’t be bothered to get out of bed. Convenience really is critical - the fewer seconds it takes, and the less effort it takes, the more likely any feature is to be used. The same can be applied to mobile apps: optimizing every experience to be as straightforward as possible is key to increasing customer retention and engagement. Deep linking from push and in app messages to the relevant page, streamlining onboarding processes and making your user interface clear and simple can all ensure that getting the job done takes no longer than it would to explain it to Alexa. The popularity of these speakers also suggests a desire for conversational, personal interactions. We expect our digital assistant to know that when we ask about restaurants, we mean restaurants close to our house; we expect it to know that when we want to order more washing powder, we mean our favourite brand. Who would be satisfied with generic messages pushed out to anyone and everyone, when you could be receiving an experience specific to you and your interests? Successful apps give a similar experience: using geolocation to make interactions relevant, usage data to make them timely, and localization to ensure that you’re speaking the user’s language all help make mobile interactions feel more like part of a conversation between the user and the app. Digital assistants are fast becoming an important platform for marketing, and that in itself is a interesting opportunity, but what this also means is that consumers will be expecting more from every device. Omnichannel marketing really does mean omnichannel - you can’t afford to ignore either digital assistants or mobile apps. The forward-thinking businesses will be developing a strategy that delivers the benefits of this new technology across multiple devices, from smart speaker, to smart TV, to smart phone.